anet See's performances and recordings on the baroque and early classical flutes have moved and inspired audiences around the world. 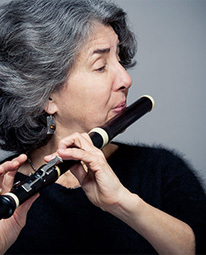 With warmth of tone and elegantly expressive phrasing, Janet is a persuasive ambassador for the performance of 18th century music on the instruments for which some of the most beautiful and enduring flute repertoire was written. Janet's informed and inspired teaching encompasses the baroque and classical instruments and also the interpretation of 18th century music on modern flute. Her teaching is enhanced by her training in the FM Alexander Technique. Welcome to Janet's web site where you will find information on upcoming concerts, teaching and workshops, discography, and listen to selected excerpts from her recordings.